Liquib treats an image as if it were a fluid. It produces the sort of distortions and manipulations that might occur on a liquified surface, including drop, wave, marbled paper and Droste type effects. It is a graphics tool (or toy) that translates mathematics into visual imagery. Some Liquib simulations are fairly realistic, while others would never be seen in nature. Liquib is not overly contrained by reality or inhibited by stodgy notions of rationality. Tools and Effects can be manually applied to express your creativity with unique transformations. Or you can relax and be entertained by the Automatic Effects feature. Watch as images are contorted, distorted and transmuted by randomly chosen manipulations, always fresh and evolving. Liquib effects can be reflected onto mirroring panels to create Tiles, which can optionally be centered to maximize symmetries. The visual display can be accompanied by music from the Audio Player. Liquib display sequences can be captured to Video, and actions can be Scripted to create choreographed performances of dynamic art. A Tool is applied by clicking and dragging the mouse across a displayed image to create a particular transformation. The Stylus and Comb Tools, for example, are intended to emulate 'marbled paper' type effects, as if the image surface were wet paint. 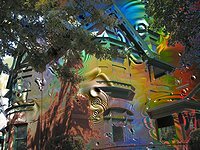 Stretch, Shrink, Grow, Twist, Slash, Contort , Rumple and Warp Tools produce various distortions of a picture. Spray applies droplets of configurable sizes, spacing and styles, Clone replicates an image segment, Bloom radiates petals around a central point, Erupt flings fragments, Droste produces recursive picture-within-picture effects, Mutate deforms images according to mathematical transformations, Shine applies various lighting effects, Relief highlights edges to create a sense of depth, Smear creates blurry, fuzzy regions within an image and Wipe produces partial transparency and other color transitions along its path. The Tools selection box is usually minimized to . The button can be clicked to show the full panel of buttons at the side, allowing a Tool variety to be selected. Effects are manipulations that evolve over time, for example after a Drop is initiated by clicking the mouse, the ripples will spread and undulate until they finally dissipate entirely. For each type of Effect, a single mouse click produces one occurrence of the effect, while clicking and dragging the mouse creates a series of usually smaller effects. Clicking and dragging with the Drop Effect, for instance, will produce a trail of 'Dribbles'. Wave, Bubble, Vortex, Melt, Flow, Quake, Aura, Beam, Frost, Bolt, Mirage, Cloud and Blaze Effects similarly move and transform. Effect actions can be paused or captured at any point. The Effects selection box is normally minimized to . The button can be clicked to show the full panel of buttons at the side, allowing an Effect variety to be selected. 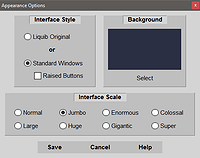 An Options screen is available for each Tool and Effect, providing parameters to control such characteristics as size, intensity, method, etc. that are applicable to that particular Tool or Effect. The range of options for the various Tools and Effects can add great versatility to their use, sometimes entirely changing their results. The Stretch Tool, for example, can make a fine adjustment to a face, or it can skew a whole image, depending on the Stretch Area Affected setting. A Shifting Colors Shading option for Drops, Waves, Bubbles, Flows and Frost produces Effects that seem to pulsate with continually shifting colors. Tool/Effect Controls can also optionally appear at the top of the screen to allow convenient adjustment of common Tool and Effect parameters, without accessing the more comprehensive Options screens each time. The Liquib Tools panel can optionally reside along the right edge of the screen. It contains convenient buttons for Tool and Effect functions and other common options. An Edit Tools bar along the bottom of the screen provides handy controls for manipulating images and Tiles. The main Liquib Menu and Windows Taskbar can thus be hidden to maximize the area available for displaying images and performing transformations. A Popup Menu also allows access to all menu options. The Masking feature merges the current evolving display with a static background, which might be either a solid color or another image. The background areas can be defined by either a pre-defined shape or a stencil image, which can optionally be created dynamically based on the current screen. 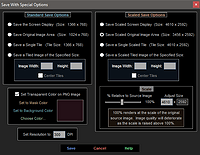 The Mask Options screen is available to configure the characteristics of Masking. It is also possible to create custom Mask Stencil images with the Create Mask function. Click the button (or just hit the Enter key) to quickly generate a randomly selected Tool or Effect manipulation with randomly chosen characteristics. Right-click (or type the F8 key) to perform a random variation of the currently selected Tool or Effect. A Sequon performs a sequence of actions for a particular Tool or Effect. While the general operation of each Sequon is pre-determined, there is also typically an element of randomness, partly dependent on how parameters are currently set. Several standard Sequons are available for each Tool and Effect, and it's also possible to create and store Custom Sequons that perform your own favorite action sequences. The button can be clicked to initiate the current default Sequon. Right-click to show a menu of currently available Sequons and options. Liquib effects can optionally be reflected onto mirroring panels to form Tiles. A Center option automatically positions Tiles to maximize symmetries. Tiles can be manually shifted to adjust their relative position within the displayed image, or Wander can be enabled to perform continuous automated shifting on Tiles according to randomly selected motion patterns. Appearance Options are available so that the Liquib interface can be configured to suit individual preferences, including the Interface Style and the Interface Scale. Most Tools and Effects can be rendered with two levels of Quality. 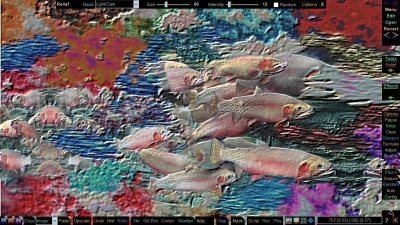 Normal Quality mode ( ) generally renders much quicker, and is often appropriate while manipulations are created and evolving on the screen in real-time. Improved Quality mode ( ) renders with greater precision and usually produces smoother, less ragged results. The default Quality mode to be used in various situations (Rendering, Recreating and Upscaling) can be configured through the Options screen for each Tool and Effect. The Render with Improved Quality when Finished option will automatically re-render the current manipulation when that Tool/Effect is finalized. The Remake function ( ) can be used to re-render the last Tool or Effect, perhaps with Improved Quality. Also, the most recently applied manipulation can be conveniently altered and re-rendered via the Adjust/Remake function ( ), which makes it easy to experiment with different parameter variations and combinations, and quickly see the results. When using source images that are larger than the screen size, the Upscale Window provides a way to render, display and save effects that are scaled up to match the resolution and quality of the original source image. The Scaled Size is adjustable. A powerful Scripting feature provides the ability to record and replay sequences of Tool and Effect actions, allowing a sort of choreography of manipulation and motion. Recorded Sequences can be saved to files. The Script Control and Editing screen provides options for loading, saving and editing Script files and Recorded Sequences. Remake Scripts can automatically be saved when images are saved so that those images can be easily recreated. Display sequences can also be captured to Video files, making it possible to share Liquib performances over the internet. A Video Options screen is available to configure Video Format, Size, Frame Rate, Video and Audio Compression Codecs, etc. Animations can also be saved as sequences of still image files, and viewed via the Image Sequence Player. The Undo button (or the U key) will reverse the most recent Tool or Effect action. An Image Manipulation History screen allows selection of multiple actions to Undo, and also makes it possible to alter parameters for past actions and then reconstruct the manipulations with any modifications. The most recent action that has been Undone can be reapplied with Redo. An Audio Player is available so that Liquib effects can be accompanied by music. It can play most of the common audio formats (MP3, MIDI, WAV, etc. ), as well as audio CDs. Flexible options are available for saving Liquib images and Tiles to files. A Quick Save feature can be used to immediately save an image according to pre-defined parameters for the save directory, file name and image format. The Save With Special Options screen provides additional choices for saving images at customized sizes. Remake Scripts can automatically be saved along with saved images so that the images can easily be recreated. Images can also be printed, or set as wallpaper for the Desktop background. 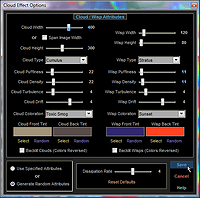 The Automatic Effects feature generates continuous Tool and Effect manipulations, according to customized settings available through the Automatic Effects Configuration screen. Masking and/or Tiling can optionally be activated at random intervals. Automatic Effects can consist of any mixture of Random Tools and Effects, Tool and Effect Sequons and Scripted Sequences. These visual shows can be accompanied by music. 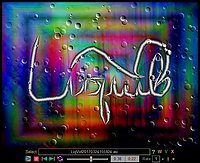 You are also welcome to download the Liquib Screensaver, which is totally free!